Food truck lovers unite this weekend! Witness Tampa break the Guinness World Record for the Largest Food Truck Rally, which Miami currently holds at 62 food trucks! Held at the Florida State Fairgrounds on Saturday, August 31, the free festival will have more than 100 food trucks from all over the U.S. Food trucks include Enjoi Sweets & Company, Thai One On, Sweet G BBQ, Off the Griddle, Inside Scoop, The Pastrami Project, LizzieCakes, Grumpy&apos;s Diner, Wrap-N-Roll, The Mediterranean Grill of The Palm Beaches, Snow Caps, Sarge&apos;s Smokehouse BBQ, Roaming Gourmand, Loafin&apos; Around Cafe, Maggie On The Move and many more. The Rally will start in the morning with a two-mile parade beginning at the ENCORE! Neighborhood in Downtown Tampa where Mayor Bob Buckhorn will kick it off by ringing the “official dinner bell.” The festival starts at the Fairgrounds at 11 a.m. with music and of course, food! Feeding America will also be accepting non-perishable food donations until 8 p.m.
Start your weekend off with Food Truck Madness today, August 30 at MOSI, featuring some of Tampa’s biggest and best food trucks. Admission to Food Truck Madness is free and additional fees apply for Sea Monsters Revealed (last weekend of the exhibit! ), Sky Trail attractions, IMAX movies and MOSI general exhibits. 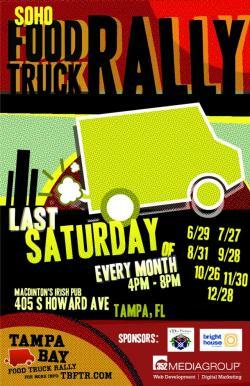 Stay tuned on more ways to unlock Tampa Bay&apos;s tasty truck scene!